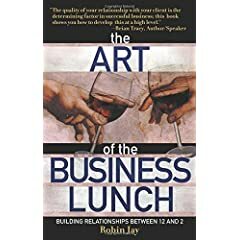 The Business Networking Lunch: Eating for entrepreneures. 'Never eat alone' as a startup. I can't remember where I first heard the above statement, 'never eat alone', but it's a truism for entrepreneurs that has legs. Last week I had a number of lunches with people I'd like to get to know better. Nothing particular in mind and no presupposition other than to know someone better. Last week I had lunch with Jordy (jordyblog) and Pete (shmula). I knew neither of them well. Now I would count them both as friends. I had no ulterior motive. No pressing need. No 'reason' other than I would like to know these individuals better. Opportunities come from relationships. Everything's an old boys network, even if there are no boys and they're not old. You will never know who is in a position to help you or your business. Corporate Alliance has some excellent thoughts on this. They refer to it as 'relationship arrogance', which I thinks an accurate description. CA posits that you will never be able to distinguish who is truly relevant to you and in disregarding anyone, you circumcise your network. Ouch. (They don't actually use that term.) Corporate Alliance is not a perfect solution for entrepreneurs, but they do have a number of good philosophies and mechanisms for creating relationships. Some of my very good friends have come from just going to lunch.